Fixed-blade knives are rarely this dynamic. 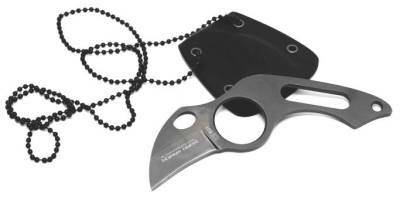 From the compact size and sturdy feel to the bottle opener and blunt tip, the Epic is the perfect knife for any camper. Cook, eat, drink, and be merry. The reversible pocket clip is designed for right or left carry. The locking sheath allows for tip-up or tip-down carry. It's a compact, multi-use, fixed-blade knife--it's the Gerber Epic Knife. The name speaks to the impact this little knife will have on your camping or backpacking experience. 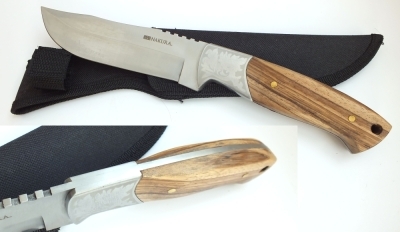 A deep thumb and finger notch between the blade and handle makes multiple uses and holding techniques possible. Gerber even designed a bottle opener into the end of the handle, and the sheath converts to a tip-up or tip-down carry for even more versatility. 5" Overall with a 2" sharpened, stainless blade. Offering wide, hollow ground, 2 inch blades, they are mercilessly sharp and can shear through the toughest materials with unexpected ease. And, due to their slant point, they offer deep penetration and precision cutting potential. The Mini Tuff-Lite folders are bred for work and offer a surprisingly good grip due to their superbly engineered handles. Made of Grivory, they offer an enormous strength to weight ratio and feature our state of the art Tri-Ad� lock, which gives them astonishing muscle for their size. 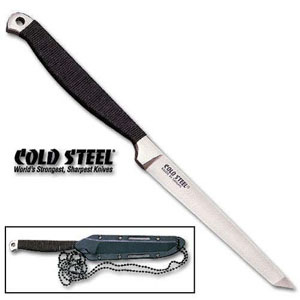 Cold Steel The Spike Tanto. 8" overall. 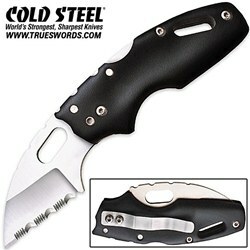 4" sub zero quench, sharpened, 420 stainless steel blade. Black cord wrapped handle with lanyard hole. Secure-Ex sheath with neck strap. Boot Knife - 9 1/8" overall. 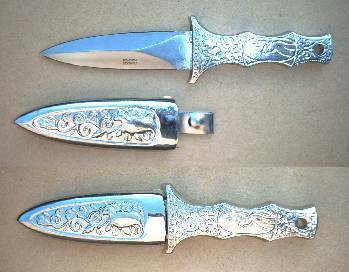 4 3/4" 440 stainless double edge dagger blade. Full tang. Black hardwood handles. Lanyard hole. Black nylon belt sheath. 7" Overall with a 3.3" sharpened, full tang stainless blade with paracord handle wrap and lanyard hole. 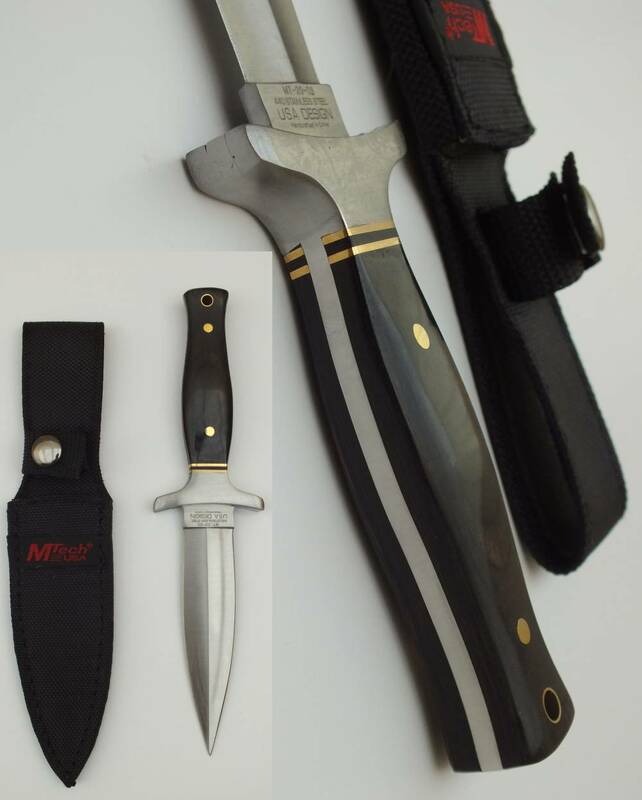 Good solid 3mm thick blade, complete in olive nylon belt sheath with magnesium fire starter, great item.